Making fire without matches, using the ancient techniques of percussion and friction, is a truly empowering thing to do. It seems to touch a primal part of us humans and it’s a thrill when the flames burst forth, every time. Developing our relationship to fire can lead to a deepening of our connection to, and respect for, life and community. In this workshop you’ll learn how to safely turn a spark or an ember into a fire that will hold its own. We’ll use flint and steel, and the more ancient friction method of the bow-drill. We’ll look at the various tinder that’s available for foraging, and you’ll learn how to prep and use it. Suitable for anyone who’s ever wanted to have a go… and also for anyone who’d like to develop their existing skills of fire-making. Bow drill takes practice, and this is an opportunity to work on your technique to build your confidence and ability. 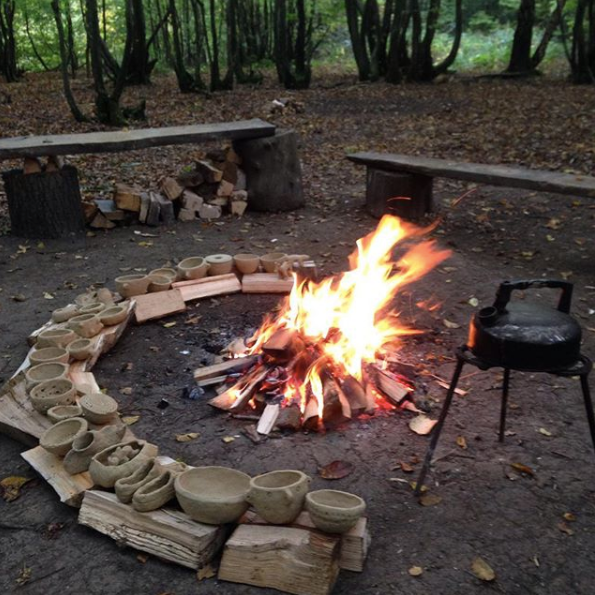 As an optional extra, you’ll have the opportunity to purchase a beautiful Native Hands flint & steel fire-making kit, handmade by Ruby, containing everything you need to make fire (cost per kit is £35). Ruby is an artist/maker and a teacher who runs sell-out courses in Wild Pottery and Wild Basketry in the woods, using foraged materials, as Native Hands (www.nativehands.co.uk). She has a special love for fire, and a deep connection to it. She loves supporting women to make fire in the ancient ways and to connect with the potential heart-opening that it can bring. Ruby has been a member of the worldwide Sacred Fire Community for more than 10 years, as part of a women’s fire community in Sussex. She has completed a number of solo fire quests involving fasting and vigils, within the Huichol tradition and also the Lakota tradition. Ruby is a regular fire keeper for women’s inipis (sweat lodges) in the Lakota tradition. ONLY 14 places available for this class and the fee will be £35 payable before the gathering. In the ocean of noise that can often feel like it's drowning us, it can be hard to hear our own voice. I'm a listener and I love to help women learn how to deeply listen to themselves in order to reconnect to their bodies. Come to this safe space were you can explore your sensuality through language, movement, breath & touch. Learn to become intoxicated by the knowledge that your desires can be met by your own touch and dare to explore the secrets of the soft waves of your own body, caressing undiscovered curves and awakening the senses. We’ll unwrap the mysteries you may have been feeling about your own pleasure, clear away the fog and dive for pearls. It takes time and gentleness, it's not about an overnight revelation but with support from me, a woman who has spent the past 4 years navigating my own reclamation, and the company of the other women, you can begin to discover & reclaim what it means to you to be a sensual woman. There will be deep conversation to break through old stories and together we'll create new language. We'll explore the breath and how when we slow down we can feel more. I will share feminine movement practices so that you can learn to surrender, to savour and experience the circling & swirling motion of your hips and your relationship to sensuality. Tea found me, in ceremony form though, only recently, when I was blessed enough to be tattooed by traditional hand poke tattoo artist Talia Migliaccio. The tattooing session being offered in collaboration with a tea ceremony performed by Baelyn Elspeth. I will never forget the experience of being served tea by Baelyn, it was one of the most intensely magical yet grounding moments of my life, I felt myself sinking into my meditation cushion, feeling so still, present, content and so thankful. A few weeks later, I was sat in the heart of the Spanish Pyrenees learning about Cha Dao and being taught to serve tea in the tradition of my teacher Wu De (Aaron Fisher) founder of Global Tea Hut, Tea Sage Hut and author of amongst others “The Way of Tea”. "We start with bowl tea to connect us first to nature and the spirit of this practice. We start with bowl Tea to bring our awareness from the head to the heart. We start with bowl Tea so we can learn to listen. We start here because it is simple… Just leaves, hot water, and a bowl"
Jordan Storm Louise lives and works in London, though she often seeks out wilder places. She’s a cancerian, a maker and a lover of our natural world. Jordan first learnt to sew and knit with her grandmother, an avid cross-stitcher, since then she’s explored her creativity through painting, drawing, movement, writing and textiles. Finding herself comfortable with busy hands, Jordan’s work (SALT Textiles) explores slow, hand made crafts. Favouring anything soft, organic and kind. Jordan (SALT Textiles) will guide a workshop introducing the practice of slow sewing and self-enquiry through mending. Our daily lives leave imprints on the clothes we wear and objects we keep, collecting stories and memories as we use them. Through the act of mending we can repurpose these objects, allowing ourselves to revisit and heal the stories they hold. Threads, needles and a selection of fabric will be provided, however you might like to bring something small to mend or fabric you love. A small donation toward materials would be appreciated but not a necessity. Of Alchemy and Rose was birthed through the natural process of weaving my creativity and Shamanic Feminine practices together. Since childhood I have expressed myself creatively and felt a connection to the magic in the world. The last few years has taken me on a deep healing journey, shedding many layers in search of connection to my own body, spirit, nature and work. I am a forever student of the Earth & Feminine Wisdom. Studying Shamanism in different parts of the world, and recently graduating from The School Of Shamanic Womancraft inspires my work, life & creations. These experiences have guided me to reclaim my own body and the ancient wisdom we each hold within ourselves. I am devoted to help heal the deep wound in our collective feminine soul and to honour our Earth. I offer workshops & circles around Feminine Wisdom, cycles & Creativity. I intentionally live round the Wheel of the Earth and the Phases of the moon. Being in rhythm with the cycles of Nature and my own body allows me to feel authentic and in flow. My work is inspired and created around this too, infused with ceremony and intention that is rooted in my life. May comes from a family of weavers and artists. Her grandmother (who has just turned 96) started weaving when she was a girl at the tender age of nine, she then in later years taught her daughter and together they passed the weaving tradition on to May and her sisters Lucie & Grace. May is a an artist currently living by her beloved sea in Brighton. Weaving is one of our favourite things to do when we gather, busy hands, quite minds. Beginners Weaving will get you started on your weaving adventure. In this intimate class you will learn how to warp your loom, a few basic stitches of woven tapestry including plain weave and fringe, and finishing technique.